It’s time to stop being your own worst enemy and avoid speaking such unfavourable words for your hair. Negative self-talk can increase your stress level and adversely affect your body (and your hair is no exception). The mind and body are inextricably linked, and every thought can have a huge impact on our physiology. Research shows that staying optimistic strengthens our immune system, and our body’s ability to handle stress. Apparently, people who stay positive don’t fall ill as much, and have a better health overall. Unfortunately nobody is born with a ‘stay positive’ degree. However, we can easily train ourselves to be optimistic, and even the most pessimist people can turn positive by practice. When we say positive statements about our bodies, we are rewiring our minds with more healthy thought patterns, and this will translate into better health. The same logic applies to our hair. Whenever you find yourself falling into a pattern of unhelpful hair bashing, consciously substitute your revised, more realistic and affirmative self-talk. Positive hair affirmations will help you care for your hair better, relax your scalp, improve the health of your hair, and prevent hair loss. Remember that affirmations take some time to manifest. It is not going to be as simple as reciting the hair mantra, and your hair will be transformed into luxuriant and silky tresses. To see any noticeable change, you will have to repeat them many times in a day for at least a month. For the affirmations to work faster, visualize yourself receiving what you desire. And bid goodbye to many years of bad hair days. At the beginning, it will feel like a lot of effort, but once the momentum picks up you will be surprised by how quickly you see the results. For hair affirmation to be effective they must always be written or said in present tense. For example, instead of saying “I will take care of my scalp and hair” you must say ” I take good care of my scalp and hair”. There is one more important consideration when making your own hair affirmation: the affirmation should be realistic and believable, and that would create a more positive response. For instance, exceedingly high goals such as “my hair is growing 5 inches every month” or an extremely curly hair person saying “I have straight hair” may be subconsciously rejected by your mind and therefore it will have no impact, and you’ll just revert back to your original pattern. Begin by setting small goals like – “I have soft hair”. Practice saying this for 5 to 10 minutes in a day. Repeat in your head and/or out aloud. You can remind yourself to say these affirmations whenever you are combing your hair or stroking it or massaging it. Send it love and speak with love and care. And please Refrain from saying anything harsh to your hair, even if you may be tempted to do so. Along with your affirmations take necessary action to achieve soft hair. It’s about being conscious not only of your thought process, but also how you treat your hair during the day. So if you want soft hair you will avoid using excess chemical on your hair, use natural cleanser, and conditioning hair mask regularly. When you practice these affirmation you will achieve greater results with less effort. Moreover taking care of your hair won’t feel like a tedious chore, rather you will do it happily and well. Being positive is not some voodoo magic, but you are getting connected with your intuitive self which lies sitting dormant. Make affirmations part of your daily life, and not just limited to hair. By learning to think more positively, while being realistic, you are setting way for beautiful and happy life. So what is your hair affirmation? Is the above affirmation good? Now , I have black , dense, thick , strong and healthy scalp hairs. Instead of saying my hair is getting thicker and stronger should I change my affirmation to my hair is thick and strong;even though it”s not yet? It used to be very thick and strong. Yes, that a better statement than getting thicker. I started doing similar affirmations a couple of months ago after reading and listening to Louise Hay and similar personal growth / spiritual authors and speakers. I have been telling myself I have “fertile, functioning follicles”! My hair has been thinning for almost 20 years and has really been terribly depressing for me. I am 38 now. I must say I am extremely pleased with what is happening to my hair since starting my self-love and affirmations kick. It is definitely looking fuller and healthier. I am very excited! You get so stuck with conventional types telling you there isn’t much that can be done, that it is down to genes, that hair gets worse with age and that’s that..and then you discover a whole new world and way of thinking, and suddenly anything is possible! 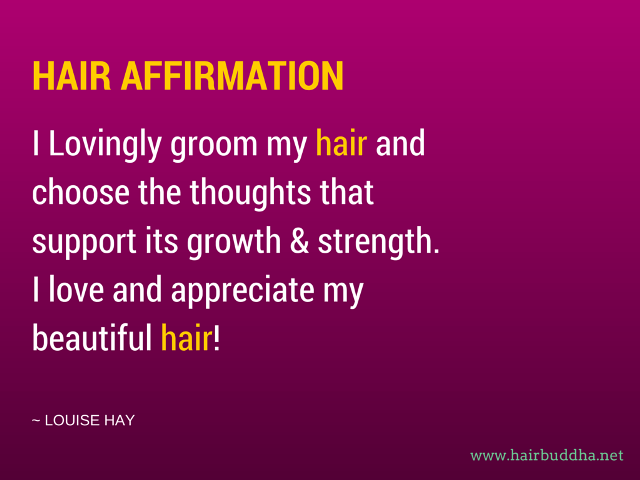 Thanks for your wonderful post and affirmations, I am pleased to see that others encourage hair growth in this way. Now I know I am not crazy. I speak to my hair every day, positively of course! I even wrote a positive affirmation that I speak to my hair everyday. Here it goes! I will detox my scalp for you to grow radiant and beautiful. I will take good care of you to produce lustrous dense hair, thick, full of length and grow abundantly. I promise to give you only what Mother Nature creates for you. You will get all the shampoos and conditioners from oils, butters, all plants, herbs and botanical s.
Therefore you will bloom, shine, be healthy, lustrous, grow longer and faster. I love and adore you my Crowning Glory! By the way I am in love with your website already. Its good to find someone that share the same interest as you do. saying I love hair is understatement, “I am obsess with hair and natural remedies for hair. Especially the Ayurvedic method of taking care of your hair. Hello Sandra, I love your affirmations, especially the first one – I detox my scalp, we so easily take our scalp for granted. And thanks for your kind words for hair buddha, they mean a lot. Look forward to hearing more from you. Have a lovely week ahead. Thank you for your affirmations as I have adopted them as my own. I was speaking over my hair but not to this degree. I absolutely love it because life and death is in the power of the tongue. We can either kill our hair with our words or give it life with our words. God bless! Hi what are some natural shampoos that you use? Thank you. Hi Mayank, continue nail rubbing, and also get yourself checked for any vitamin deficiencies or hormonal imbalances. 2. Eat amla (dried or fresh) every day. 3. Oil massage twice a week.